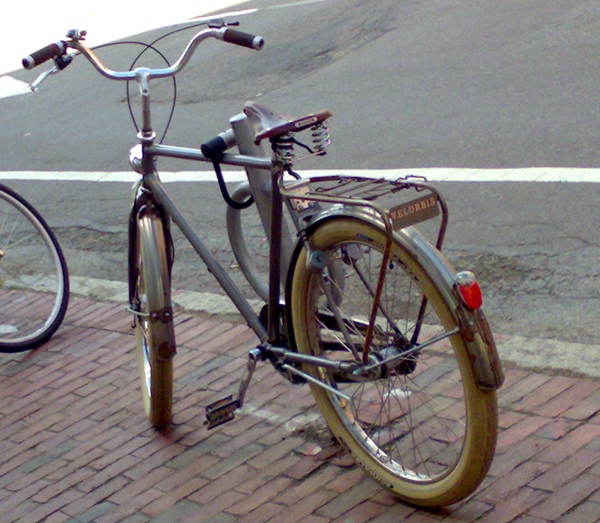 Velorbis Scrap Deluxe, spotted in the wild in Cambridge, Mass.! This bicycle is absolutely gorgeous, and I especially love the pairing of the silver frame with the cream tires and the warm brown leather of the saddle and grips. I like a bicycle that will look good when dirty. This one looks great dirty! One question however: Is that rust on the fenders and rack?.. Edited to add: a reader forwarded me an email with the following message from Velorbis: "The bicycle in question is a Scrap Deluxe limited edition we made in 2007 WITHOUT any rust protection nor powder coating hence the name scrap deluxe. It was an intentional design and it was meant to rust to give it a 'scrap' look. We quickly realized that people didn’t get it and we quickly reverted to rust protection and powder coating of all our models in 2007 so today you will not have any issues with rust on your bicycle from Velorbis." Hope this response on their part is helpful to those wondering about rust. 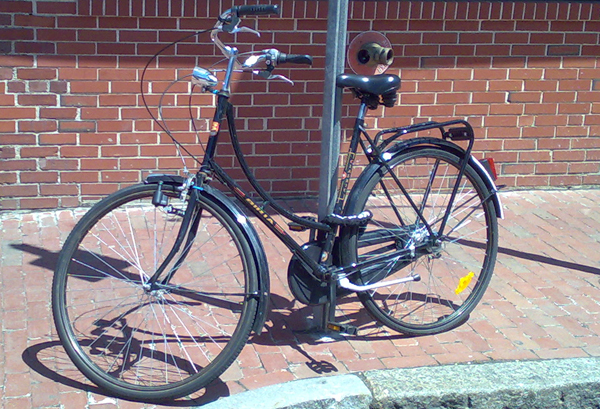 Here we have a Biria Classic, parked in Harvard Square. 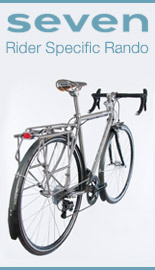 A very stylish bicycle that can be had for a fraction of the price of imported Dutch bikes. And the same Biria Classic, only in red, for sale at Cambridge Bicycles. The price tag says $450. 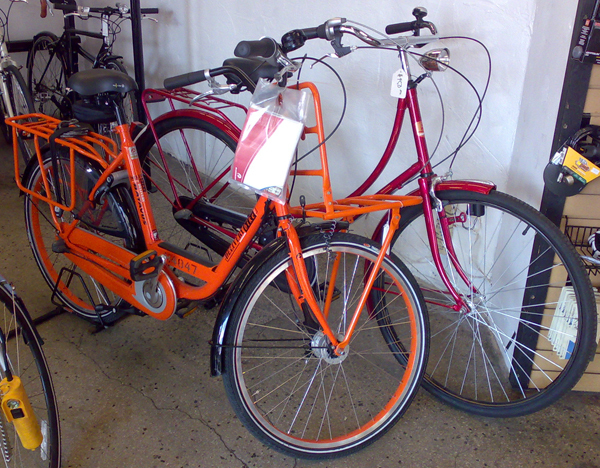 Next to the Biria is an orange Batavus transport bike. Very cool, and I bet that stands out in traffic! And what do we have here? Yes, it's is the Rivendell Betty Foy, casually displayed at Harris Cyclery. Each Betty Foy is finished according to customer specification, and it is interesting to see the differences between the floor model at Harris and Dottie's beloved Betty at Let's Go Ride a Bike. I like Ms. Foy best when she is fitted with fenders, a rear rack, and brown leather saddle and grips -- but I absolutely love the red brake cables that Harris put on her; they are the perfect touch! 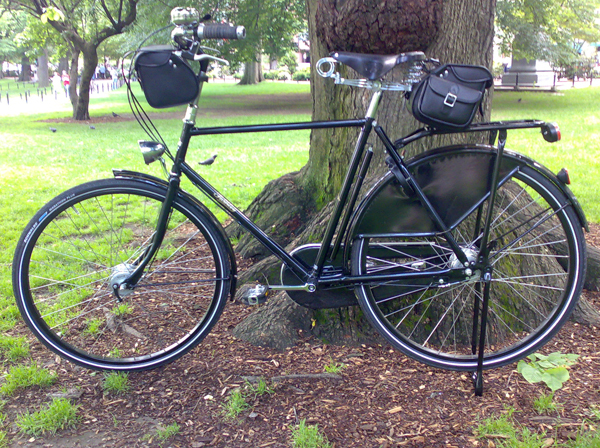 And finally, here is my Co-Habitant's Pashley Roadster again, in the glorious greenery of Boston Commons! A Betty Foy - yay! Not quite in the wild, but close enough :) I must agree with you that cork grips, fenders, and honey saddle are soooo much more complimentary on her - but then I'm completely biased. I love all the other fantastic bikes (esp. his Pashley). I never see other bikes like those around Chicago. It seems that the fenders on the Velorbis are made from a reddish metal, possibly copper and then plated. The plating is wearing off, showing brassing marks and looks quite interesting. I don't recall seeing proper rust anywhere. I almost wonder if Velorbis designed these parts to look worn/antique/rusted on purpose. Can you say Scrappy Deluxe? I really like seeing these Biria bikes. I've noticed them everywhere in Boston, often ridden by couples where the man is piloting some sort of classic/antique traditional large frame and the woman is on a black or red step-through Biria. The Pashley is getting dusty & well broken-in. It's surprisingly nimble and responsive for such a heavy bike. In case anyone wonders, the bike + bags + stuff in those bags (and U-lock) is probably pushing 65 lbs. There are modifications being planned: I am going to add some battery-powered lights after the eye-opening experiences with ATVs, pedestrians and invisible cyclists, clad in all-black, on the Charles. Also pondering a secondary (more stable) kick stand under the bottom bracket, Azor-style. The Pashley is pre-drilled for one. 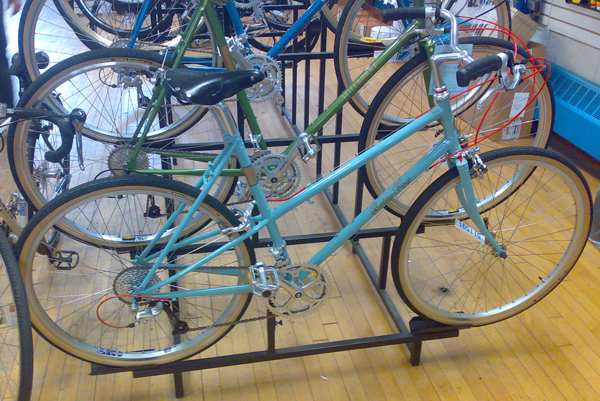 Dottie -- I can't wait to get back to Boston, so that I can actually have a look at this bike in person. 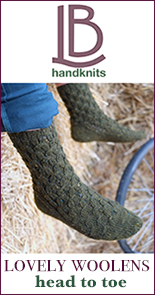 The beautiful close-ups on your site have been driving me mad with desire! Cathy -- Hurray for the North Shore! 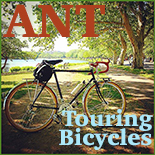 We love going to Marblehead and Salem, and soon we'll do that via bike! If you want the netted dressguards I posted about, let me know and I can bring more from Europe. Re: Velobris -- You are saying that the fenders are intentionally made to discolour in that way? Interesting concept. I must say it does look good, but I am not 100% sure that I would want this feature on my bicycle. Re: Biria -- Yes, as far as low-priced brands go, this is the bike I'd recommend. Notice that the frames are lugged! The Velorbis website says that the fenders are zinc coated under a layer of powder coat, so they shouldn't be rusting like that (zinc corrodes white, not rust colored). Makes me wonder if the owner of this Scrap did something to it. Either that or there is some defect in the finish of this bike. I actually have one on order, so it's an item of concern. Hope it's not going to be an issue. At least the frame itself isn't rusting. So after a couple of minutes of thought I have figured out the Scrap issue. I don't think it is an intentional design, but rather an oversight. The bolts holding the fenders are stainless steel and the fenders are zinc coated. This causes a reaction when the two metals are exposed to the same electrolyte. An enhanced oxidation/ corrosion of the less noble metal (the zinc) occurs, resulting in a rapid corrosion of the fenders that otherwise likely wouldn't occur at all. So if you're getting a Velorbis, you might want to think about swapping the bolts on the fenders for zinc bolts instead of stainless ones. This should prevent the reaction I just mentioned from corroding your fenders. And I'm guessing that there is something on that rack assembly that is causing a similar reaction. You can get zinc anodizing sprays at your local hardware store if you're worried about this ruining the look of your bike (it will make the whole surface a greyish-silver, which should match the bike pretty well anyway). Sorry, I meant galvanizing spray, not anodizing, and I only offer that suggestion for preventing the rack from corroding (along with changing the screws). I don't think anybody would want to ruin the finish of the beautiful frame with galvanizing spray! Josh - Those are interesting observations. Velorbis makes beautiful bicycles, but they are a fairly new manufacturer and perhaps they are still figuring out some of the details. Thankfully, fenders and racks are easily replaceable, should some not feel up to the methods you mention. 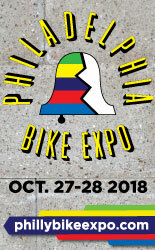 Please report back with your impressions once you receive and test out the bicycle! Filigree- I will definitely post an update with some impressions once the bike arrives. Great site. Love the pics. Josh- I'm thinking about ordering a Scrap Deluxe and was wondering what your thoughts on it were? I am guessing you have long since decided what to do about the Scrap, but in case you haven't, and for anybody else with the same question, I fully recommend the Scrap without hesitation. It is an incredibly comfortable and well made bike. Velorbis put tons of thought into the details of this bike, and it shows. The hub mounted dynamo and drum brakes make a big difference in wet weather, and the balloon tires provide a really smooth ride. I think what struck me most is that the bike actually handles very well and is quite agile. While it is fully upright, the narrower handlebars and frame geometry actually make it great around turns and weaving through traffic. I also have a dutch bike and the Scrap is much more capable. I have the 5-speed SA version, which is really smooth, and I can personally vouch that the "neutral" problems of the old SA hubs seem to have been fully eradicated by Sunrace. I also have to add that I LOVE the full center bike stand that it comes with. This is great for two reasons, first, it holds the bike fully vertical, so when you lock it to a post, it's less likely to lean into the post and scratch the frame. More important, however, is that if you need to work on the bike or repair a tire (I ended up with an errant safety pin in my rear tire the 3rd time I rode it), the center stand holds the bike fully upright while you work on it, even after you take a wheel off- this is a huge convenience. There are only two caveats I would mention. The first is that the bell that it comes with has plastic gears and it jams all the time- making it pretty worthless. I replaced my bell with a brass Crane bell right away, which was $10, is louder, never has any problems, and I think looks pretty sharp. However, for such an expensive bike, you shouldn't have to replace any items off the bat. The second thing you should be mindful of is that if you should blow a tire, the rear wheel takes a bit of work to get off. It is not too big a deal, but the rear hub linkage is a bit more involved of an assembly (at least on the Sturmey hubs) than some others you might be used to, so it takes a bit more time. The only other issue that really exists here, I guess, is price. They obviously are not cheap, and there are cheaper cycles out there that are at least a similar style. However, if you are looking at a Velorbis, or Retrovelo, or any bike actually made in Europe, you are fully aware of the options, you consider a good bicycle an integral part of your life and you want the best. In this department, the Scrap won't disappoint. It is comfortable, fun to ride, and can carry a lot of weight on the sturdy rack, and there is no a feature you will feel is missing. The frame is beautifully assembled and finished, and the parts (save the bell) are all top rate. The quality is second to none, and it has never let me down in the past 4.5 months of daily commuting through the streets of Brooklyn and Manhattan (about 17 miles a day in all). I wholeheartedly recommend it and would buy it again in a second. "The bicycle in question is a Scrap Deluxe limited edition we made in 2007 WITHOUT any rust protection nor powder coating hence the name scrap deluxe. It was an intentional design and it was meant to rust to give it a 'scrap' look. We quickly realized that people didn’t get it and we quickly reverted to rust protection and powder coating of all our models in 2007 so today you will not have any issues with rust on your bicycle from Velorbis." Alice, thanks for investigating. I will include your quote in the main text of the post, if you can forward me the original message from Velorbis to "filigreevelo-at-yahoo-dot-com" for verification. 1. I asked Velorbis about this last summer, and they gave me a different answer from the one they they gave you. I was told that the bike in the picture was part of the first batch ever made, and they unwittingly used a paint or treatment on the fenders that reacted badly with the metal. This was said to me on the phone in maybe July 2009. 2. Several moths ago, I saw a black Velorbis bike - I think it was the Churchill, or whatever their standard men's frame bicycle is - that was fairly new and also had rust on it. The rust was on the seat stays, towards the top, and in a few other areas. It was not a Scrap Deluxe. I have nothing against Velorbis and I think their bicycles are very attractive. But I think they need to figure out some QC issues and other minor glitches, especially given the price of their product. I also think that at that price level, a bicycle should not have a unicrown fork - but that is just an opinion.